I have discovered that Faith may be expressed in many ways in New Mexico. From private family chapels to building adornments, people profess. These are few of the images of Faith I have seen in my travels. The images are local, urban and rural. They can be hard to find, and they can be displayed proudly for all to experience. I have worked in the environmental field for thirty-five years, some of those years in New England but mostly in Colorado. I have always enjoyed the outdoors, hiking, biking and discovering. My interest in photography began after receiving a film camera as a teenager. That was when I merged my love for the outdoors with photography, focusing mostly on the landscape. My wife Debby and I moved to Santa Fe in 2006, semi-retired, and adopted the digital format completely. Before moving here, we planned most vacations to the Southwest, enjoying the high desert, native cultures, grand vistas and beautiful colors. 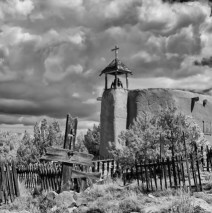 Although essentially self-taught, I have attended several local workshops (with local photographers Tony Bonanno and Efrain Padro), and have taken several digital photography seminars and continuing education classes presented by the Santa Fe Community College. I belong to the Photographic Society of Santa Fe where members benefit from fellow photo enthusiast’s insights.